Bose QuietComfort 35 II review | What Hi-Fi? “Man is by nature a social animal”, said Aristotle, and that remains as true as ever. We text, tweet and message each other – and some even employ smart assistants such as Amazon Echo or Google Home to help streamline their communication. But now we are talking to our speakers, our watches and our phones, it makes sense that we should be able to talk to our headphones as well. That’s the thinking behind Bose’s QuietComfort 35 IIs, the updated version of the QuietComfort 35s which came out in 2016. These new headphones have a dedicated button to activate Google Assistant, which lets you play music, answer questions and read your smartphone’s notifications. Add that to the QC35 IIs’ great audio quality and noise-cancelling capabilities, and you have a pair of cans that will make their owner more connected. Mainly found in Android smartphones, Assistant is Google’s equivalent of Apple’s Siri or Amazon’s Alexa. Once set up through Bose’s Connect app – or, for Apple users, the Bose app combined with Google’s Assistant app for iOS – the QuietComfort 35 IIs will chime whenever your phone gets a new notification or automatically read out upcoming calendar events. Receive a text or other online message, and press the button on the left housing to have Google Assistant read it out. It then gives you the option to reply using your voice. It’s a handy addition, especially during the winter months. It’s much simpler to respond to texts or make calls at the push of a button than it is to fish your phone out of your pocket, remove your gloves and bash out a hasty message with frozen fingers. There are some limitations, however. While you can use these headphones to control and play your music, you’ll need to use Spotify in order for Google Assistant to work. It’s currently unable to access your offline media or link with other services like Tidal or Deezer (and if you’re on iOS, we found it unable to stream music using the Assistant at all). If you’re connected to both a laptop and a smartphone (the QuietComfort 35 IIs have the ability to connect to two devices at once), we find that activating the Google Assistant to read a notification on our phone also starts up iTunes on our MacBook. For some reason, it also refuses to read out your contacts’ surnames, so if you have multiple people of the same name in your address book, you’ll have to work out who your message is from. We imagine that Android users will get more than Apple users out of this functionality, though. The synergy between these headphones and Android just seems slicker than with an iPhone. If you aren’t bothered about the smarts, you can program the button to cycle through the headphones’ three noise-cancelling levels instead (‘low’, ‘high’ or ‘off’). Like the original QuietComfort 35s, the level of noise-cancellation from these cans is impressive. 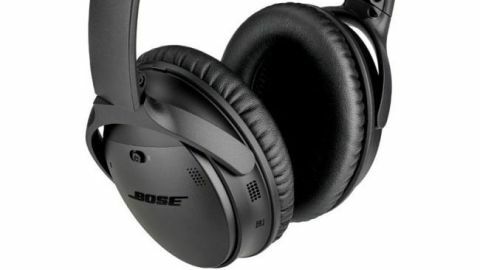 Bose has always been at the forefront of silencing constant rumbles or hums, and that remains the same here – the microphones inside and outside the headphones effectively eliminating any irritating background chatter. If we have one complaint, it’s that the noise-cancellation could be a little more intelligent, for example in the same way Sony’s WH-1000XM3 headphones disable noise-cancellation when you hold your hand over one of the housings. B&W’s PX headphones pause your music when you lift the earpad up, allowing you to have a quick conversation. We’d liked to have seen similar features in these headphones – but, then again, Bose’s competitors don’t have Google Assistant. Battery life is a claimed 20 hours with a wireless connection, or 40 hours of just noise-cancellation if you’re using the 3.5mm cable that comes in the box. Charge the headphones using a micro-USB cable and you get an extra 2.5 hours of juice in just 15 minutes. The QuietComfort 35 IIs certainly live up to their name. At 310g, they are significantly lighter than the B&W PXs and have a softer grip than Sony’s headphones. Those needing a pair of noise-cancellers for long journeys should definitely bear these in mind. The hinges on the housings mean the headphones fold down nicely, and their build quality suggests that they could survive being kept in a rucksack, without the need to keep them in the carry-case that comes with it. The buttons around the right housing control playback. They are intuitively placed and feel good to use. You’ll soon get used to the series of taps needed to rewind or skip your songs. The QuietComfort 35 IIs have a great handling on any music you send their way. We begin with The Beatles’ Let It Be, connected to a MacBook Pro, and these headphones impressively manage to dig up details you might not otherwise hear. Paul McCartney keeps irregular timing when building up to the chorus, singing lines a little later than you’d expect. When he does, the QuietComfort 35 IIs pick up the barely audible sounds of the faint movements of his lips easily. Playing Teenagers by My Chemical Romance, these headphones pay great attention to the midrange. There’s no denying the scornful assonance in Gerard Way’s lyrics and the snarl as he laments the loss of teenage individualism. Each powerful bass note is weighty and nuanced; from the lowest depths as the drumstick hits to the way the sound disperses and fades into the soundstage, you can make out numerous layers to the sound where less talented headphones would struggle. On the other end of the sound spectrum, these headphones keep a controlled and measured management of the high treble. The soaring vocalisations in Now We Are Free, from Hans Zimmer and Lisa Gerrard’s Gladiator soundtrack, are far reaching without any hint of a sounding brittle or brash. Dynamically, these headphones can take the changes in intensity in their stride. From the quieter drums and strings that rise up when the song begins to the hearty, husky tones of Lisa Gerrard’s idioglossia (her invented language) that fill the space, these headphones make smooth transitions allowing you to really become immersed in your music. But while these headphones have an enjoyable sound, their rivals are a clear step ahead. The WH-1000XM3s have an earthier bass and more insight, while the PXs have a better sense of rhythm and dynamics. Nevertheless, the QuietComfort 35 IIs certainly feel like the smartest pair of headphones around at the moment. They may not be the absolute best sounding pair of cans at this price, but they offer functionality their rivals simply cannot match. The integration with Google Assistant – especially when you’re out and about – is a definite positive and their noise-cancelling abilities are second to none. The updated tech is indubitably worthy of the QuietComfort name.